Travel-Tot: Deal Alert: Travel-Tot Promo Code! Deal Alert: Travel-Tot Promo Code! 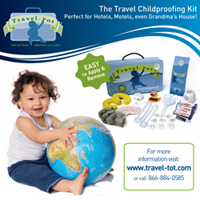 Use the code BIGDEAL when ordering to get your Travel-Tot Travel Childproofing Kit for $19.95! 5 Great Travel Reads For Kids! Safe and Happy Holiday Travels! 6 Ways to Keep Your Children Safe!